John Deere Operations Center allows producers to see what is happening, collaborate to maximize profit, and direct a plan with precision. Visualize the current location of JDLink™ enabled equipment and where they have been over the last 60 days on the web and the MyOperations mobile app enabling logistics optimization and answering questions about what has happened in the past. See the results of field operations by reviewing documentation maps in Field Analyzer and summary information in the Agronomic Reports. View historical maps anytime, anywhere using the MyOperations mobile app. Establish partner relationships with trusted partners, allowing them to access machine and agronomic information to efficiently support an operation. Leverage third parties to pull information from the Operations Center and to send it back through application program interfaces (APIs), enabling a single, centralized source of data for an organization. Create setup files and send them wireless through Wireless Data Transfer (WDT) to minimize start time in the field while ensuring accuracy in the work completed. Use Remote Display Access (RDA) to see the display in the cab in order to support machines running in the field, minimizing downtime and trips to the field. Plan and track maintenance schedules with factory recommended or custom plans for equipment. Monitor and update plans from anywhere with the MyMaintenance mobile app. Utilize the MyOperations™ mobile app to access daily summaries, field productivity, and quality details for an operation, enabling efficient management from any location. 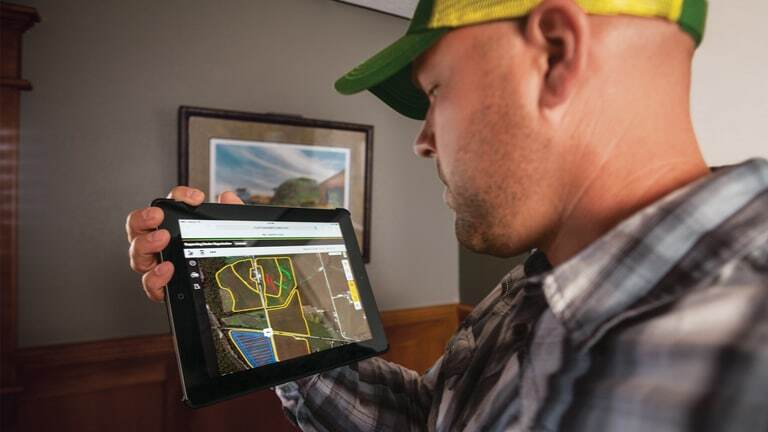 John Deere Operations Center is a set of online tools that enable access to farm information anytime, anywhere. Tools in the Operations Center provide growers and their partners with the ability to analyze, edit, and make collaborative decisions from the same set of information to optimize logistics, plans and direct in-field work, increasing yield and profitability. Combined with its complimentary suite of mobile apps and the power of live connections to the machine through JDLink, the Operations Center enables producers to manage operation more efficiently, reducing costs and raising profitability. Achieving optimal yield and reducing waste are important for a manager. Mistakes on the job can be costly to yield, waste inputs and time, and ultimately affect profitability. Managing this stage of the operation can be chaotic, inefficient, and cause a manager to be on the phone for hours per day trying to coordinate work, monitor progress, and make sure the job gets done right. It takes numerous meetings, phone calls and even field visits, which are all prone to miscommunication and costly errors and delays. Replace lists and phone calls with the Jobs panel, various jobs tool in the Operations Center, and the MyJobs App on a mobile device. A job is simply a complete list of all tasks with all the necessary instructions to execute the job accurately—right product, right field, right time, and right settings. 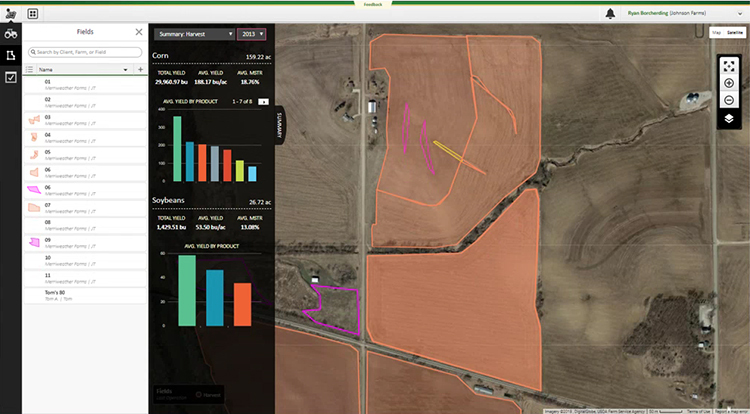 After the field is complete and data is sent in, the grower or partners can review map layers to ensure work was completed as intended and make adjustments in the next fields. As operations grow, keeping a pulse on what is happening with equipment and operators at any given time becomes more of a challenge. The John Deere Operations Center makes this easier with features such as Location History, Remote Display Access, and the MyOperations™ and MyAnalyzer™ apps that allow a manager to see what is going on anywhere, anytime they choose. With a bird’s-eye view of the farm and the ability to remote view into the cab, the Operations Center is an essential tool for today’s progressive grower. Growers who are capturing agronomic data are usually doing so to enable and improve decision making. Users need to have tools to evaluate the data, ensure its accuracy, and take action on it. 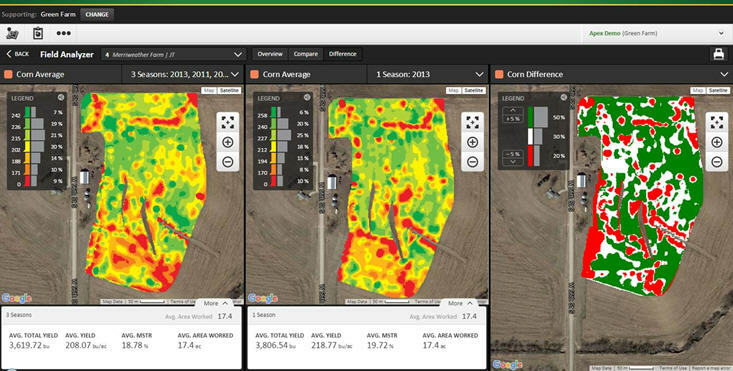 The John Deere Operations Center equips users with tools that make data interpretation easier than ever so that they can understand the factors influencing yield and take action on those insights in the field. Agrian is a trademark of Agrian Inc. Growers rely on many people inside and outside of their organization such as staff, John Deere dealers, agronomists, landlords, and crop input manufacturers to help them make decisions about their agronomics, machines, and more. 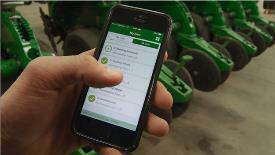 The John Deere Operations Center makes the process of sharing machine and agronomic data easy and customizable. In the Operations Center, growers can establish a sharing relationship with staff and partners and electronically share a view of their operational information automatically. This allows them to better control and secure their data while making it available to those who can help them gain insights that increase productivity and reduce costs. Maintain control of data visible to the team and partners. Decrease time it takes to transfer and share data with advisers. Maximize ability to collaborate and gain insights and profitability from data. Any existing and new data is accessible only by those with approved access in Operations Center and connected mobile apps. API connections with partner programs automate export of new data for analysis and make it easier to import prescriptions, additional map layers, and other information. Manual raw data downloads and shares allow for analysis in other farm management systems. Shapefile exports allow users to manually export edited map layers from the Fields panel in order to share information in a common file format and to use in other farm management systems. Data routing enables users to easily share raw files with partners. This allows service providers to share information with clients to provide field records for operations performed for hire. John Deere dealers and partners have the ability to set up and manage accounts and organizations on behalf of users once a partnership and permissions with the dealers are established. Online Help has more how-to information. A how-to video for the Team Manager tool is available on the John Deere YouTube™ channel on the Operations Center how-to playlist. Farmers do not farm alone. Collaboration with retailers, input providers, software companies, equipment dealers and many others is necessary to make timelier and more accurate decisions. 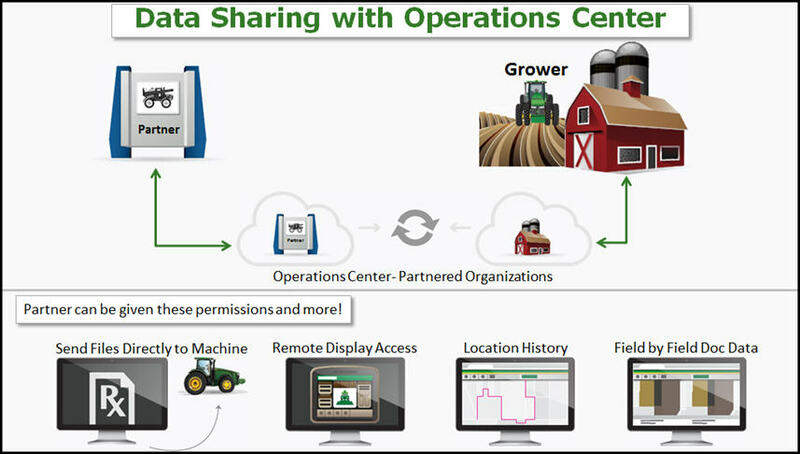 The John Deere Operations Center is an open platform that enables producers to connect with their preferred partners and software tools. For more information about connected software tools, visit the MoreTools page within Operations Center, or go to the direct link at: https://MoreTools.Deere.com. Company Application Does this application work with my Gen 4 data? Does this application contribute insights back into the Operations Center? What does this application do? AGBRIDGE is a trademark of Scruggs Equipment Company, Inc. Onsite is a trademark of AgIntegrated, Inc. Advantage Acre is a trademark of AgReliant Genetics LLC. Agrian is a trademark of Agrian Inc. Echelon is a trademark of Nutrien Ag Solutions Inc. Agrible is a trademark of Agrible, Inc. FarmLens is a trademark of Agribotix LLC. AssetScan is a trademark of ATEK Access Technologies, LLC. FieldView is a trademark of The Climate Corporation. DataOnTouch is a trademark of Co-Alliance, LLP. My Farm Manager is a trademark of Decisive Farming Corp. Encirca is a trademark of Pioneer Hi-Bred International, Inc. Farmers Business Network is a service mark of Farmer’s Business Network, Inc. AgDrone System is a trademark of HoneyComb Corporation. MyAgData is a trademark of Independent Data Management, LLC. AgMRI is a trademark of IntelinAir, Inc. RemoteAware is a trademark of New Boundary Technologies, Inc. T3RRA Cutta and T3RRA Design are trademarks of Precision Terrain Solutions. WxAgrios is a trademark of 7417722 Manitoba Ltd. Premier Crop Systems is a trademark of Premier Crop Systems, LLC. FieldAgent is a trademark of Sentera, LLC. 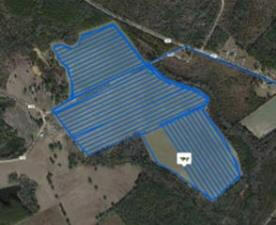 Trimble is a trademark of Trimble Navigation Limited Corporation.